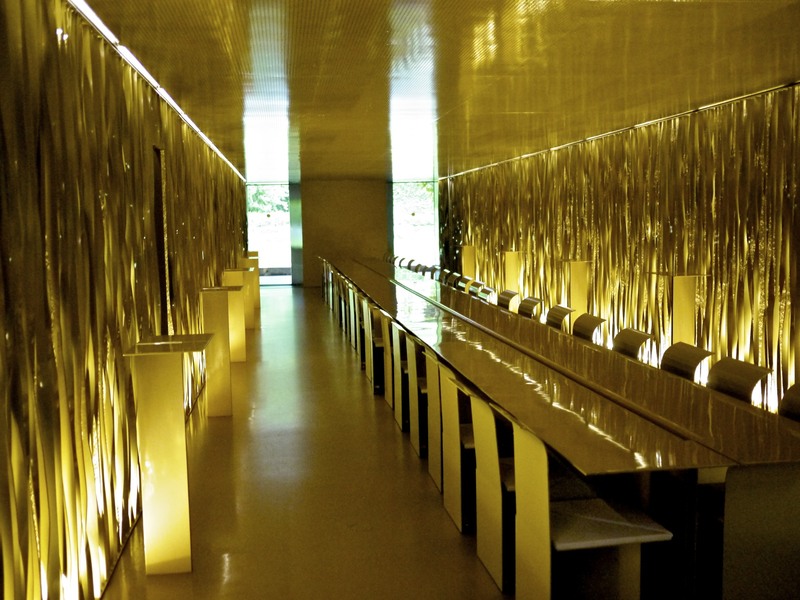 Following the recent success of el Celler de Can Roca and Ferran Adria’s legendary el Bulli, Catalunya has rapidly emerged as a serious contender to the culinary Mecca of Spain, the Basque region. 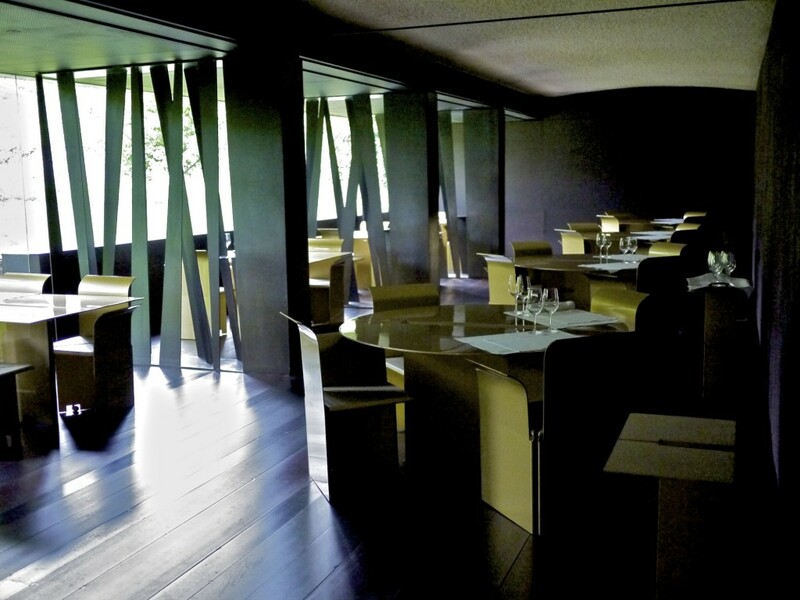 Having slowly worked my way through the region’s top restaurant over the past few years including el Bulli, Can Roca, Sant Pau, Compartir and Comerç 24, my attention turned to a two Michelin starred restaurant located in the capital of the volcanic region of la Garrotxa that had managed to keep a very low profile. I couldn’t find much public information nor knew anyone who had personally been there so I was slightly suspicious. However, I was yet to be let down by a bad experience from a starred restaurant in the region so I decided to bite the bullet and organised a table with a friend who writes for the Lonely Planet’s food segments. After all, Can Roca in my opinion was the best in the world when they only had two Michelin stars so what could go wrong? Alright, I appreciate that when you’re in a foreign country you can’t expect people to speak fluently in a language foreign to them. But when you’re at a two Michelin starred restaurant where half the clientele that evening consisted of English speakers, you’d expect the front of house to have rehearsed the presentation in the prevailing language, particularly when you have a simplified menu in that language. Unfortunately that was not the case here. Lucky for me I spoke a decent level of Spanish and Catalan. On the topic of other diners though, perhaps the fact that the two English couples next to our table were dressed like clowns in hippie clothes should have been the first sign of warning that evening. So sue me, but I think some effort should be made by diners if you’re going to a nice restaurant. I don’t necessarily mean a tie and suit, but tie-dyed shirts and sandals are hardly appropriate for this setting. 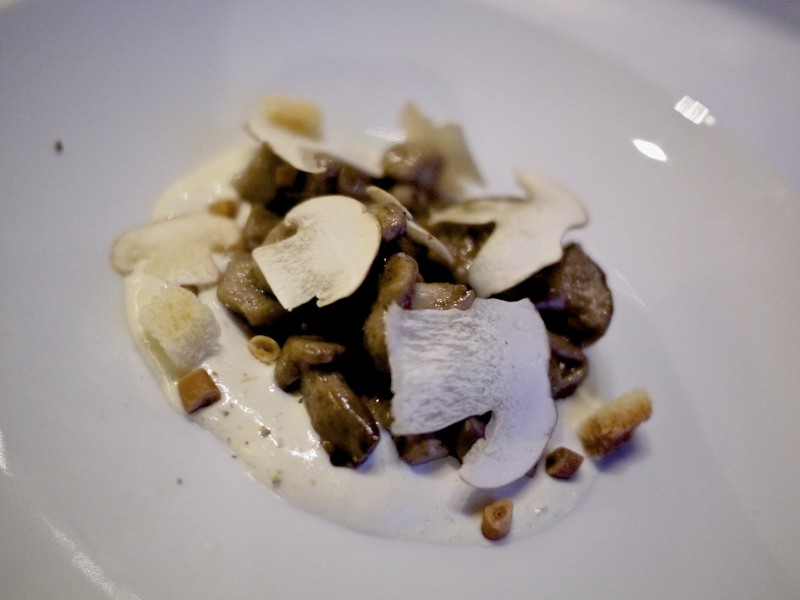 We had two choices on the menu that evening which were a vegetarian or standard tasting menu that reflected the seasonality of this mountainous region. We naturally went with the standard tasting menu. 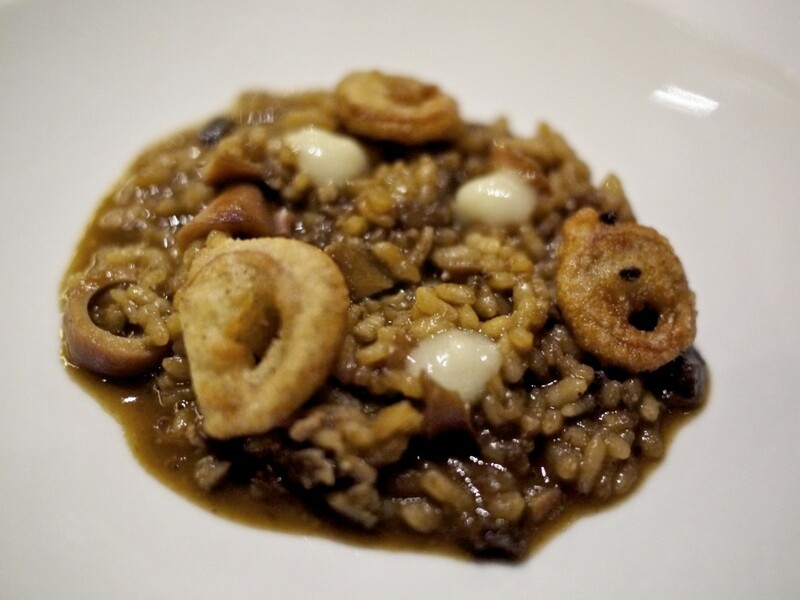 The Garrotxa is famous for buckwheat so we were advised that they would be using it frequently throughout the menu. Fine by me as long as it tastes good. We were offered a glass of cava from Penedes to start the evening. 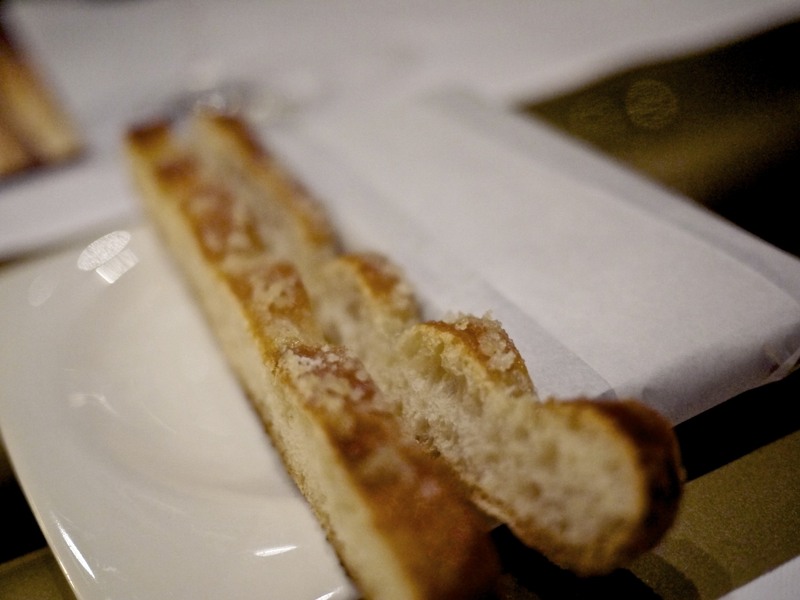 First up was an appetizer of Crujiente de fajol de la Garrotxa. 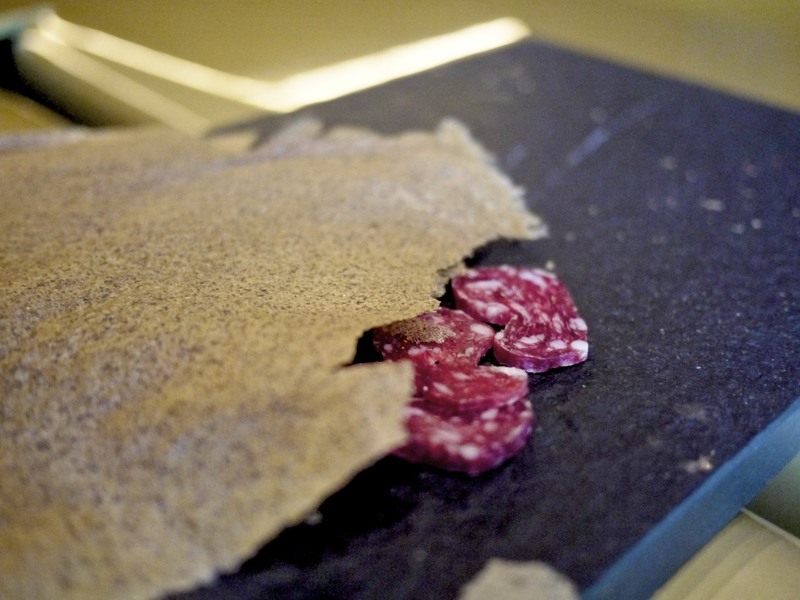 It was essentially a crispy sheet of buckwheat from the Garrotxa which had a few slice of llonganissa, a Catalan cured sausage, hiding underneath. It was hardly anything gastronomic but one of the better courses that evening. You have been warned. This was followed by a plate of Buckwheat blinis with Sant Pau beans on the right and Cornbread sandwich on the left which had a warm polenta filling. The sandwich, dough and beans, which had a similar consistency to porridge, had no flavour whatsoever. Maybe the chef had forgotten to season it or perhaps I was missing a point? 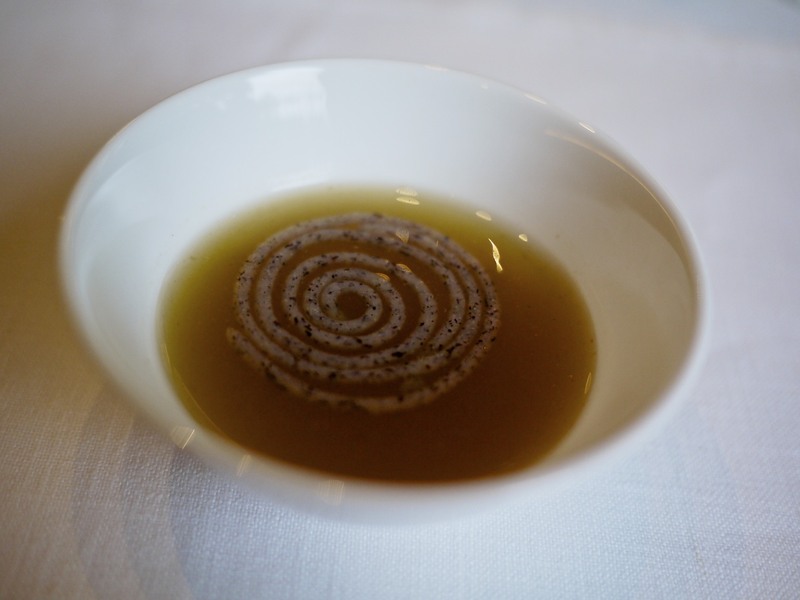 This was followed by a warm Buckwheat spaghetti in smoked broth which tasted of gizzards. My heart sank. This was possibly the worst start to a meal I’ve ever had. Sure, the ingredients were fresh and of good quality but I felt as if my taste buds had gone on holiday. 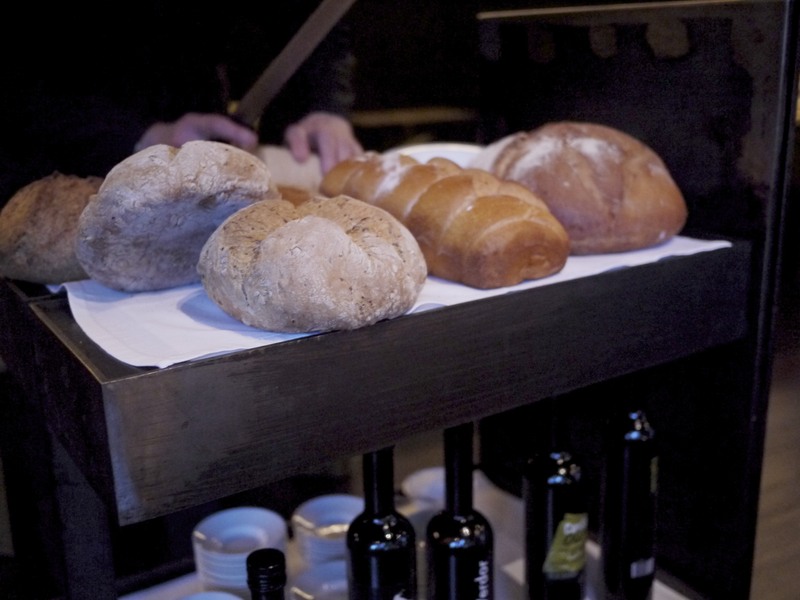 A trolley containing local Garrotxa bread with a choice of five local olive oils, ranging in aromas and taste. As everything so far lacked in flavour I asked for the strongest flavoured oil to compensate my palate which was rapidly losing interest in anything that was being offered. I had a feeling this was going to be one of those meals where I may need to rely on the bread for survival. Sure enough, I was right. Damn. I hate being right in these circumstances. As I was driving that evening I could only take a limited amount of alcohol so I opted for a glass of local white and a red to match the relevant segments of the meal. 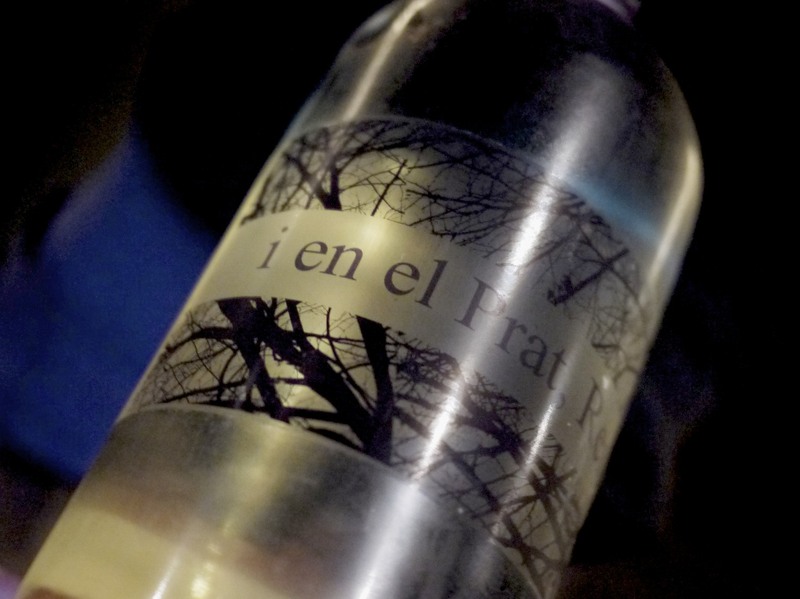 First up was a white garnatxcha from the Garrotxa’s terra alta. 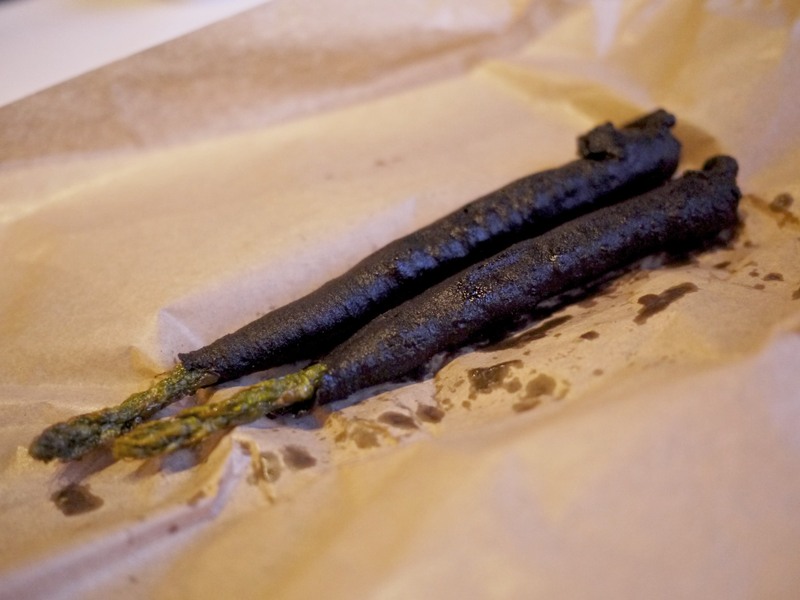 A slight improvement with our first course of the evening with the Wild asparagus in a charcoal tempura that was served with a beetroot romesco sauce. The tempura was not too oily but had hardly any crispiness to it. What’s more, other than the flavour of the romesco sauce there was no seasoning at all. What did they have against salt? 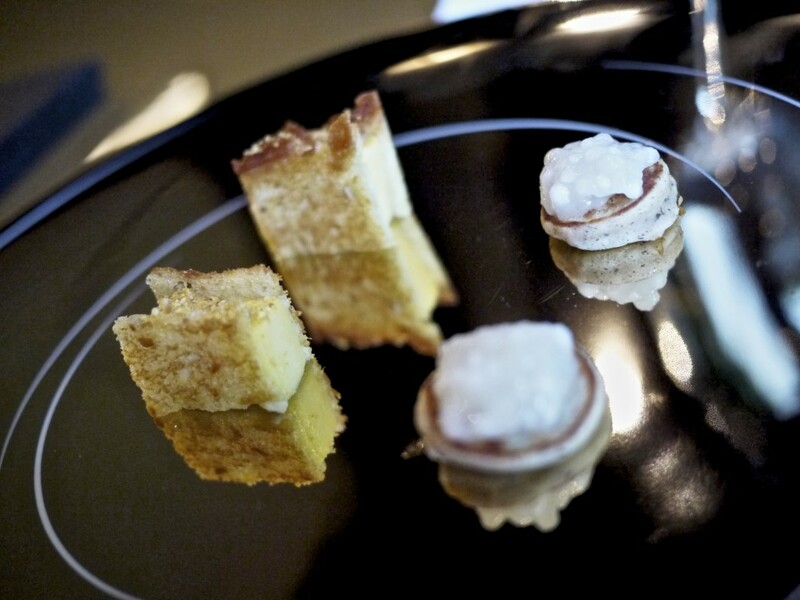 One of the reason why I chose this tasting menu was because of a couple of mushroom dishes that looked delicious, well at least on paper. The Wild mushroom raw & cooked had some great textures including thin and meaty mushrooms as well as crunchy croutons made from the local bread, Tortell d’Olot. But guess what? Yup, you got it right. No seasoning again. Our night continued with further disappointment with the Fresh egg, mayonnaise and tuna. Granted, it was interesting because the tuna had been infused into the mayonnaise but the only texture in this dish was liquid. It was just sauce and runny egg, and worst of all it tasted like the tuna mayo filling from a sandwich. Yet again there was no seasoning but this course made me frustrated because the quality of their home reared hen’s egg was superb. What a waste of good ingredient again! 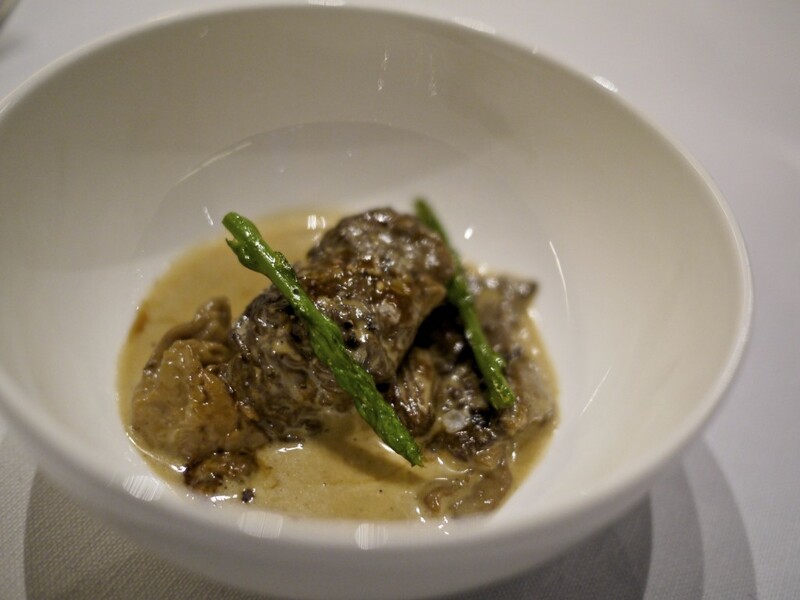 I was scared of trying the most anticipated dish on the menu, Morels, wild asparagus and stew sauce by this point. Things actually looked surprisingly positive initially. The creamy sauce had a bit of seasoning and depth in flavour, and the ingredients were again fresh. However, a fundamental error ruined this dish. It was gritty. The morels had not been cleaned properly. How could this happen in a two starred restaurant? 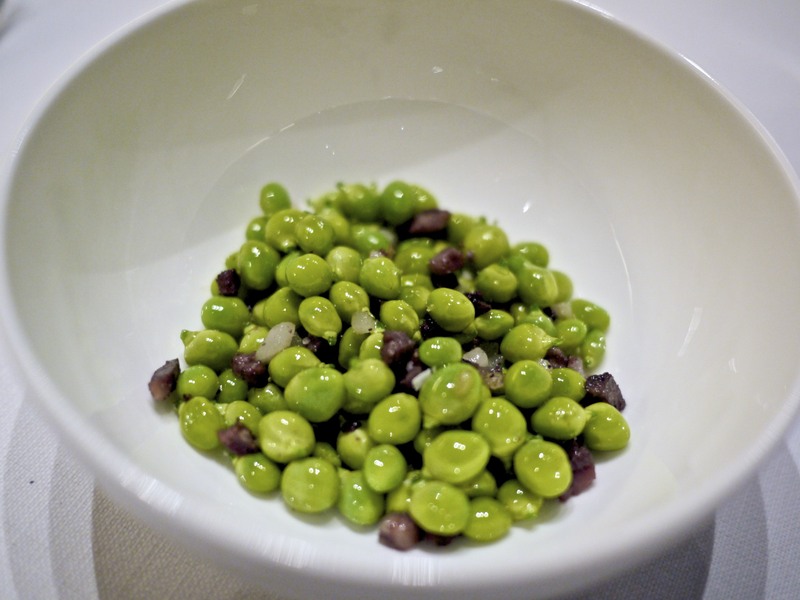 Grilled peas, bacon and blood sausage. The texture of the beans were amazing and just exploded each time I took a bite. I also enjoyed the smokiness until it rather became overwhelming and one dimensional. The bacon and blood sausage hardly added any seasoning to the dish and it was screaming for some salt. Our second glass of wine was poured to go with the next segment of the meal. 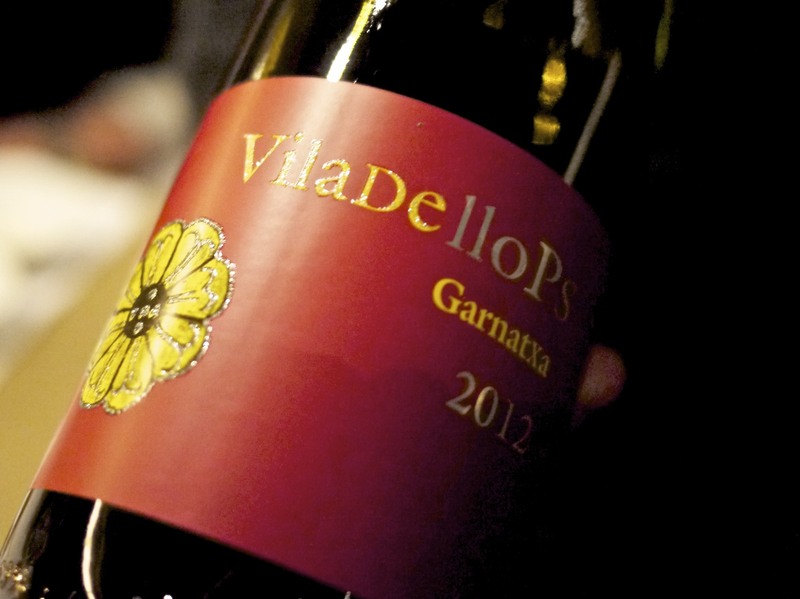 It was a Viladellops, Garnatxa 2012. Rice with squids. Slightly sloppy presentation on a plate and probably would have been better served in a bowl. It was very again one dimensional where the seafood jus dominated the palate and the aioli was utterly lost. 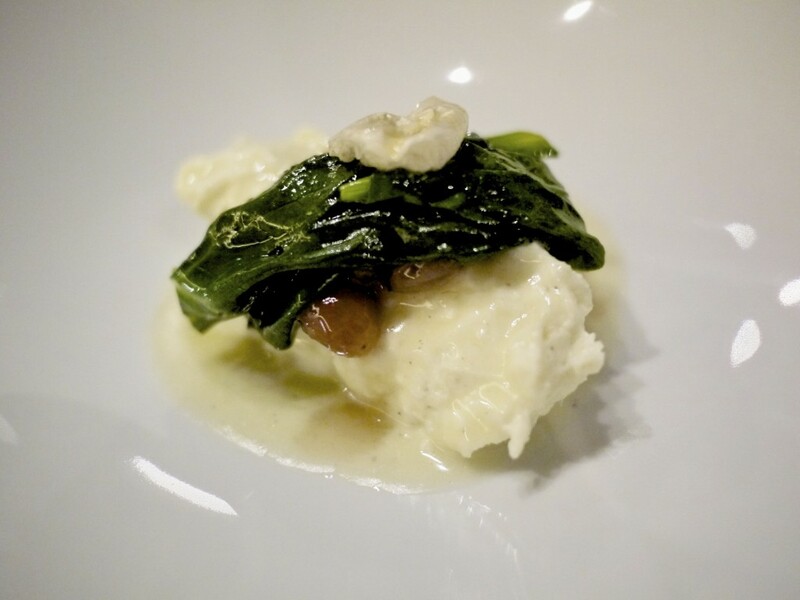 My friend’s favourite course of the evening was the Salt cod brandade served with white grapes and spinach. 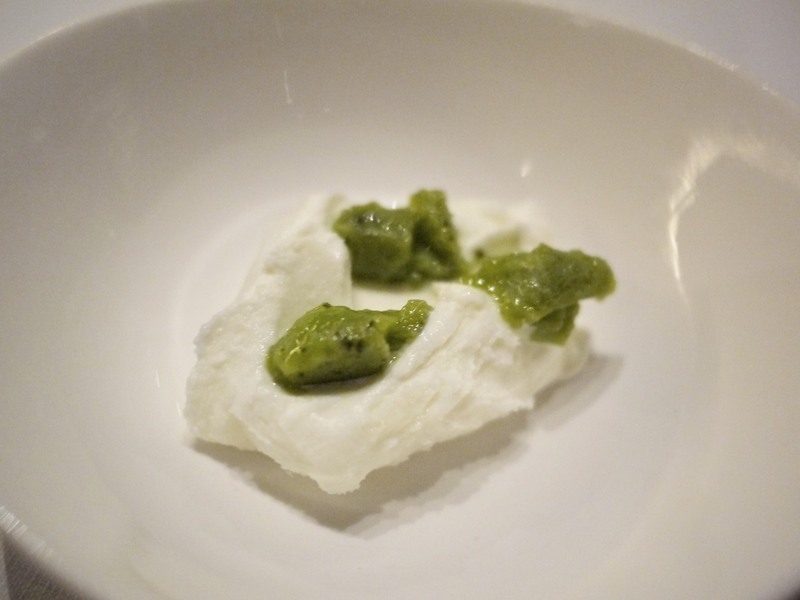 The texture was very interesting again as the cod brandade had been salted and reformed to resemble a fillet. We finally had some seasoning but this time it was just too much. I had to wash this down with a couple of glasses of water and half my glass of red wine. Thank god it was the final segment of the savory courses. Duck, salsifies, pear and smashed biscuit. Duck and pear is a tried and tested combination that is difficult to fail but they somehow managed to screw that up as well. This dish was offensive in that the pear and biscuits were far too sweet and belonged in a dessert. The only decent thing was the texture of the duck. It was pretty clear by now that this restaurant was all about ingredients and texture, neglecting the most important thing called flavour. Three hours into our meal and it became clear that there were other significant issues as well. For one, my friend had to refuse her glass of wine and water being topped up countless times. No one in the front of house communicated with each other and it became rather irritating. If it was any consolation, at least the dozens of mosquitoes in the dining room were having a great time at our expense as we were scratching ourselves all night. 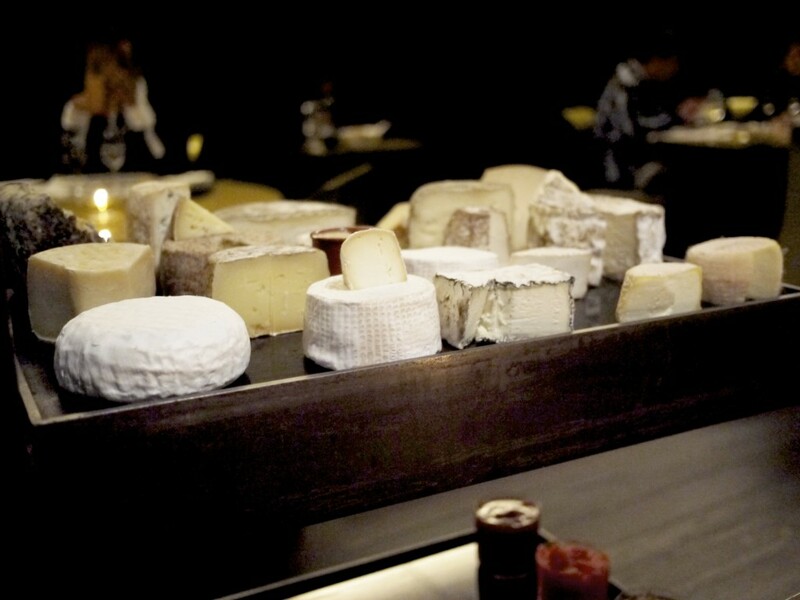 We decided to rush through the rest of the meal starting with the Catalan cheeses. At least they had my favourite regional goat’s cheese, the Petit Nevat. 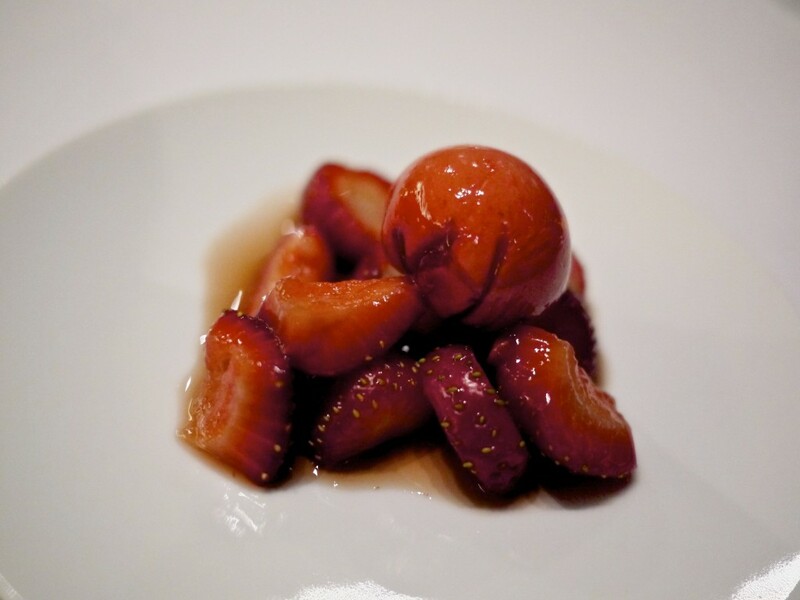 We were slightly relieved in that we thought having taken salt out of the equation, dessert would have been much better starting with the Strawberries and rouleau de crème. Our relief was short lived. It was just strawberries and cream. Surely you can’t serve something like this in a fine dining establishment! Iced cottage cheese, creme caramel and basil. This was the best dish tonight. 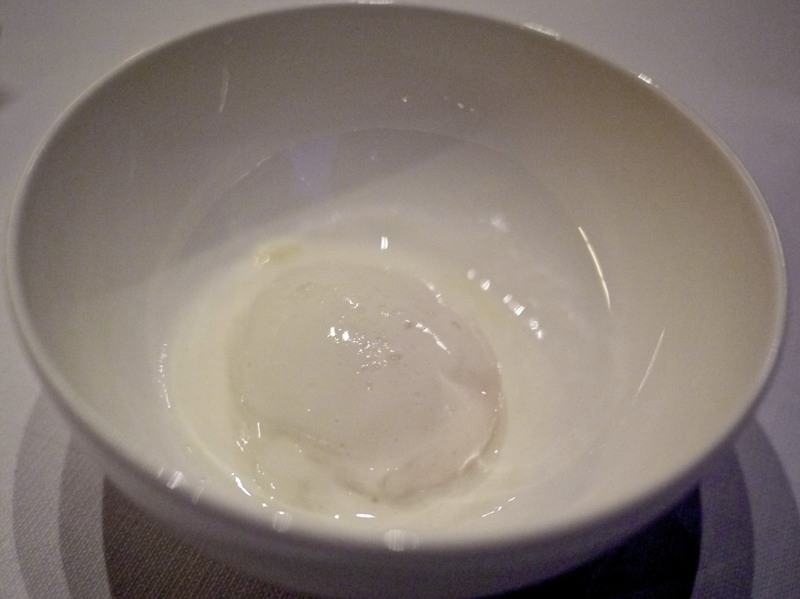 I loved the basil flavoured milky sorbet that cut through the cottage cheese. 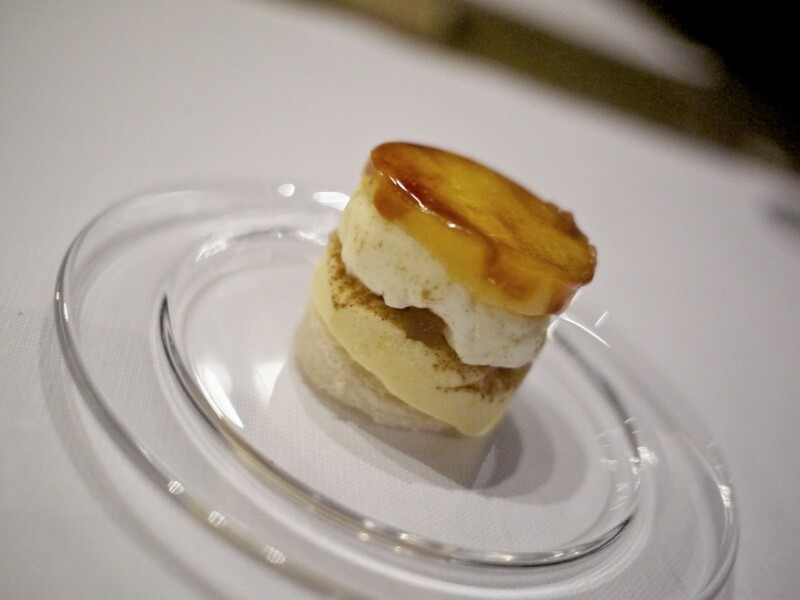 The creme caramel added a subtle sweetness keeping this a very refreshing course. I did think this could have worked better straight after the cheese course though. Frozen cake, preserved fruits and burnt egg yolk. A rather uninspired finale that tasted like something that had been pre-made in a package. A dull ending to an extremely disappointing meal. Crusty sugar bread and dark chocolate was served as petit fours although I didn’t want to stay here any longer and even skipped my coffee. The staff encouraged us to have a coffee and a tour of the kitchen but I refused politely. I wanted to get out. Fast. Needless to say, this was a terribly underwhelming meal. I’m not sure if other people around us were enjoying it but you certainly didn’t get the “oh’s” and “ah’s” from any table when the courses were being presented. 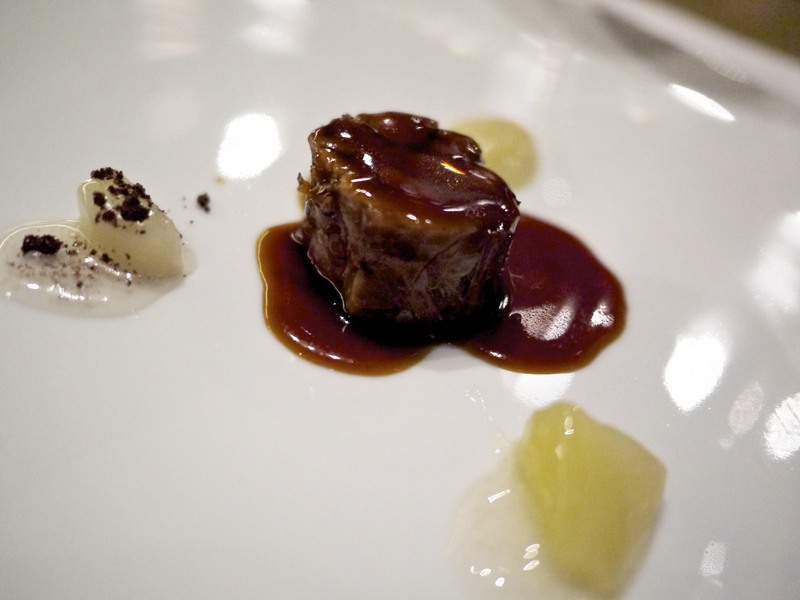 The food was not only lacking in flavour but also imagination and depth. Granted, the quality of the ingredient was good and the textures were interesting but it felt tired and I couldn’t sense any passion from the front of house working there. For one, the Maitre’D looked like he was just dragging himself around the dining room utterly lifeless. 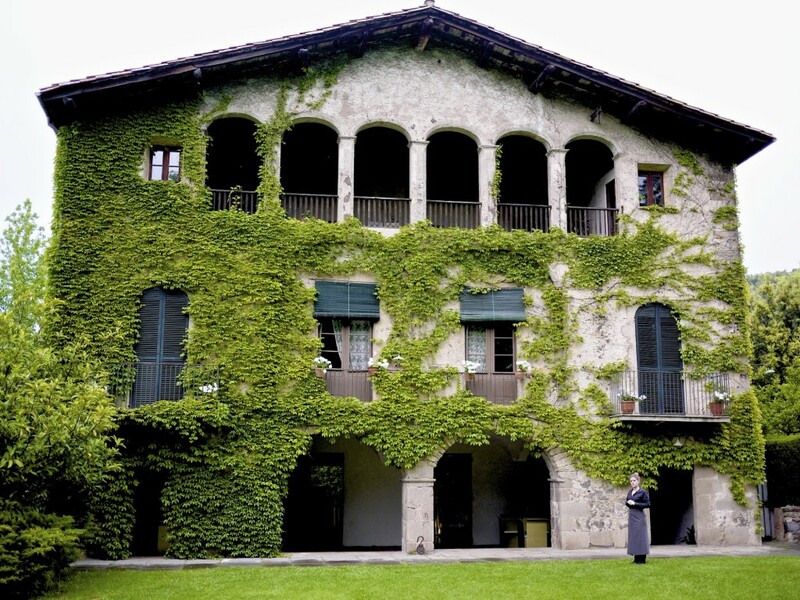 My friend was much less critical saying she would come back just for the architecture but I thought 240 euros for two people with hardly any wine was absurd. This place has so much potential and the location is magnificent, even if a bit isolated. However, there are fundamental errors that cannot be forgiven and nothing makes me angrier than ruining good produce and ingredients. If you want to let the ingredient shine then treat it with respect and draw the qualities out. 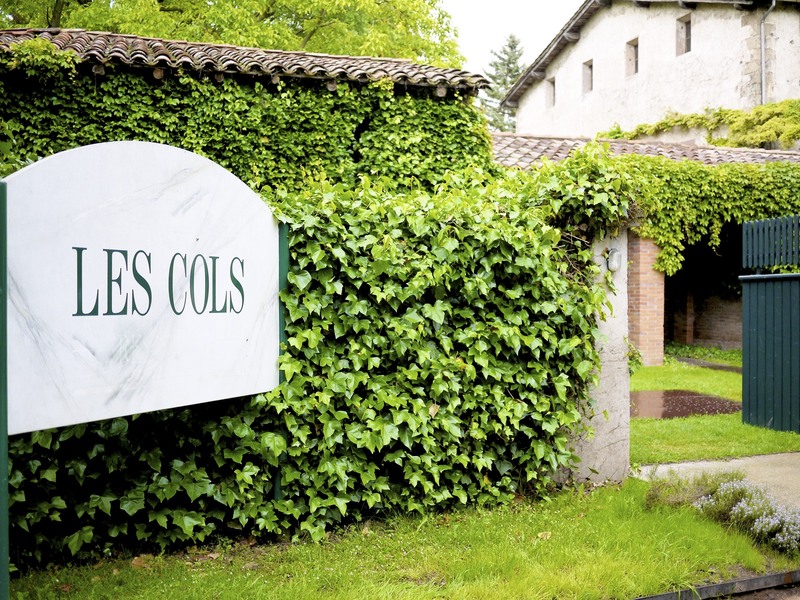 This entry was posted in Spain and tagged Fina Puigdevall, Garrotxa, Les Cols, Olot on June 7, 2013 by admin.